IFTTT, which stands for If This Then That, is a service that may automate a lot of things related to PCs, online and your mobile devices for you. Basically, what it allows you to do, is create so called recipes that run automated actions when an event occurs. Events can be nearly anything, from you arriving at work over new email messages, or a new post on your favorite tech blog. IFTTT supports Android devices so that you may use existing recipes on Android, or create your own. You do need to install the IFTTT application for Android for that, and register an account on IFTTT, but that is all that is required. The following article looks at some of the recipes that are already available for Android. The recipes are sorted into the groups WiFi, Muting / Silent Mode, and Other. The following two recipes are examples of what IFTTT can do to optimize wireless connections on your device. Recipes are available to connect or disconnect from WiFi networks based on the location, but also on other parameters such as the day or time, or certain events. 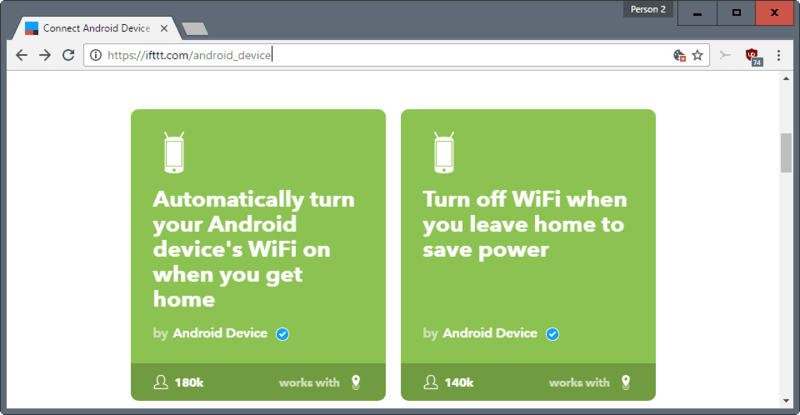 Turn off WiFi when you leave home to save power -- The recipe turns off the wireless connection of the Android device whenever IFTTT's application notices that you left home. You do need to set up your home location during the configuration of the recipe. Automatically turn your Android device's WiFi on when you get home -- This recipe will turn on the wireless connection on the device when you get home. Location may use cellular, GPS networks or WiFi to determine the location. Simply pick your home location on a map to configure the recipe. The following recipes change the device's mute state or enable modes such as silent mode. Mute your Android phone when you arrive at work -- This is a simple recipe that works similarly to the ones described above. You need to set up your work location during configuration, and will notice that your device gets muted automatically whenever you arrive at work. Unmute your phone when you leave work -- This is the companion recipe for the mute when you arrive at work recipe. It unmutes your device when you leave work. Automatically mute your Android phone when you leave home -- The recipe mutes your Android phone when you leave your home. You need to set up your home during configuration. Automatically unmute your Android phone when you get home -- Self explanatory. Unmutes the device when you reach your home. Mute your Android phone at bedtime -- If you mute your phone whenever you go to bed -- I do because even a vibrating phone wakes me up easily -- then you may find this recipe useful. It mutes your phone at a specific time of the day. Works best if you go to bed around the same time every day. Unmute your Android phone's ringer every morning -- The companion recipe for the one above. Disables the mute status of the ringer in the morning at a specific time. Call Twice: override mute on second call for select VIPs -- Configure your Android device to unmute automatically when you receive a phone call from a very important person. The next time that person calls, the ringer is on so that you may catch it. Note that this will turn on the ringer for all phone calls. Work time log using WiFi network -- This recipe logs the time you spend at work. You can create your own Android recipes on IFTTT if none of the existing recipes offer what you are looking for. Head over to the create page on IFTTT to get started. The whole process is done in six easy steps. First, with the Android device as the service. Choose a service: select Android as the service. Connects to a Bluetooth device. Disconnects from a Bluetooth device. Connects to any WiFi network. Disconnects from any WiFi network. Connects or disconnects from any WiFi network. Connects to a specific WiFi network. Disconnects from a specific WiFi network. Connects or disconnects from a specific WiFi network. Choose action service: select the desired action from the list of supported services, e.g. send an SMS to someone, log the connection change using Google Sheets, mute your device, play music, or update the device wallpaper. Choose action: actions that are supported by the selected service are listed here. Complete action fields: if further configuration is required, do it here. For instance, if you select the mute action, you may set vibrate to on or off. Review: review the recipe, and click on finish afterwards. You don't need to select the Android device as the service in the first step. You may also select other services, for instance location, weather, or Fitbit, and pick the Android device only as the action service in the third step. The top list looks at some of the best If This Then That (IFTTT) recipes that work on Android devices to improve your experience when using the device. You’ve described location specific scenarios. I use ‘llama’ app for the same. Although its a defunt app now but still works well for me. It does more than changing profiles & activating wifi though. It’s simpler than IFTTT. IFTTT is also capable of more complex automation. I agree. Moreover, IFTTT is dependent on an internet connection, whereas Llama or Tasker, or whatever are installed on your device. I dislike the need to sign in to an online account simply to use an app on my phone that really doesn’t require, though perhaps in some situations will benefit from, online connectivity. Nonetheless I’d like an automation engine that works. I’ve tried several, including Llama mentioned in the comments. I’ve read about, but not tried, Tasker. IIRC they rave about it over at xda-developers. My biggest wish and let down is that I’d like to use an automation app to save battery but this seems patchy at best because turning on/off radios based on towers, signals, locations all seem to *require* radios to be turned on in the first place in order to determine where they are so they can run the if/then logic. Kinda defeats the purpose, doesn’t it? Of course there’s more granularity to the matter but it’s a bit tricky as radio waves or signals are kinda circular whereas we tend to exist and work in box locations. I’m sure I’m missing something but my phone can be within range of my ‘home tower’ whilst I’m at the local shops, park or whatnot. So that’s not so useful for determining when to enable wifi to check for my home router, for example. Oh well, the bigger battery I purchased with my newer phone makes a big difference anyway. Cyanoge… Uhm, LineageOS has an option called System profiles which can accomplish such tasks as well. It’s built-in, requires no internet connection. I don’t use it personally, I’m fine with doing everything manually. Plus, if configured properly, stuff like WLAN should have a negligible impact on battery life. By configured properly I mean disabling useless options like auto connect to every hotspot it finds, or disable GPS’s ability to use Bluetooth/WLAN unless you explicitly state so. What I find to be a real battery drainer is cellular data. On Lollipop there’s a bug which makes applications to always remain connected to the internet via cellular data. Especially during summer it used to convert my purse into an oven. Freakishly hot. Thankfully it’s not one of those exploding phones (ahaa). The bug is fixed in Marshmallow+, btw. Tried automating my WiFi toggle, using towers location (automate-it app) but leaving one room in favor of another few meters away – made toggle go nuts. Useless. Using GPS all the time is obviously out of the question. Wasn’t aware of cyanogen’s built in dedicated option, interesting.